The congregation of Emanuel AME was organized c. 1865 with Rev. Richard H. Cain as its first pastor. 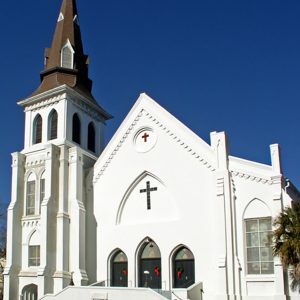 The church was built on the legacy of an African Methodist Church, which had thrived in the early 19th century, but had been banned after the Denmark Vesey conspiracy. In addition to his work with the AME Church, Cain held several political offices including serving two terms in Congress (1873-1875 and 1877-1879). In 2015, Rev. Clementa Pinckney, who also held office as a State Senator, and eight other worshippers were killed at the church when a gunman opened fire during Bible study.